These packages are designed for mixed parties of golfers and non-golfers. Golfers can choose either 7 or 3 nights 5* hotel accommodation with 3, 5 or unlimited rounds of golf. 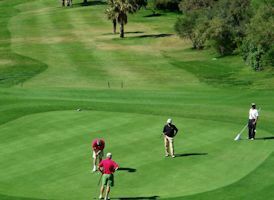 The rounds can be played at La Envia golf course or 3 different course that include Alboran Golf and Playa Serena. Non-golfers receive instead of golf, an excursion to Alhambra Palace at Granada, spa treatments vouchers or a Vital Spa Experience while the golfers are on the golf course. All the packages include, buffet breakfast, free access to the indoor swimming pool, free parking and free Wi-Fi. Airport and golf course transfers are 60 € per person based on 4 pax. Single room occupancy is available at an extra cost. Golfers receive 3 nights at La Envia hotel 5*, plus 3 Green fees on the La Envia golf course.